Willa Cather: O Pioneers! Sections 1 and 2 for Introduction to Reading Fiction. Finished skimming Rediscovering Basho: a 300th Anniversary Celebration edited by Stephen Henry Gill and C. Andrew Gerstle. David Cobb's essay "One Hundred Blyths" is a particularly fine essay, giving tribute to Blyth and his introduction of Basho to English readers. Finished The Name of the Wind: the Kingkiller Chronicle: Day One by Patrick Rothfuss. A delightful escapist fantasy novel; a blend of the academy of J.K. Rowling's Harry Potter and the creative history of Andrew Beahrs in his The Sin Eaters, spiced with some plausible-but-not-quite-familiar vocabulary. The power of music is a welcome addition. Haroun and the Sea of Stories by Salman Rushdie, who has been a frequent nominee for the Booker Prize and was the 1981 Booker Prize winner for Midnight's Children. Delightful. Pre-reading for Introduction to Reading Fiction. Finished skimming Ezra Pound: The Cantos, by George Kearns. Also auditing Travis Seymour's UCSC course on "Deception, Brain, and Behavior" to study: behavioral and brain manifestations of deception; developmental changes that allow us to understand and to use deception; physical implications of lying expressed in the face, voice, posture, and brain activity; mechanical and behavioral techniques used in deceptive behavior (overt behavior as well as brain activity). The Five-Minute Iliad and other Instant Classics: Great Books for the Short Attention Span by Greg Nagan. Finished The Sin Eaters by Andrew Beahrs. Interesting story set in early-17th-century English Midlands, where the rural commons are being taken for sheep enclosures, thereby impoverishing the rural communities, many of whose inhabitants take their skills to the Virginia Colony in the New World. The central character is Sarah, a wise, clever, and resilient elder woman. While the plot is a little forced in places and the writing often begs annoyingly for our attention to its florid use of metaphor, the story of Sarah and the people that she befriends or bedevils is memorable. Finished In the Next Galaxy, poems by Ruth Stone. but many of the others seem to be having an inner joke that I apparently am not in on. Read Issue 40.2 (Summer 2009) of Modern Haiku. Includes David G. Lanoue's essay: "Something with Wings: Fay Aoyagi's Haiku of Inner Landscape" [pp. 24-32]. Masters, E. L. -- Johnson, S. -- Stein, G. -- Frost, R. -- Sandburg, C.
Pound, E. -- William Rose Benét -- Wheelock, J. H. -- Doolittle, H. D.
Jeffers, R. -- Moore, M. -- Ransom, J. C. -- Eliot, T.S. -- Conrad Aiken (the first Consultant in Poetry to the Library of Congress to be reappointed for a second term and Winner of 1930 Pulitzer Prize for Poetry). Coffin, R. P. T. -- MacLeish, A. -- Davidson, D. -- Parker, D. -- Van Doren, M. -- cummings, e.e. Deutsch, B. -- Louise Bogan (a Consultant in Poetry to the Library of Congress) -- Marshall, L. -- Stevent Vincent Benét (Winner of 1944 Pulitzer Prize for Poetry). -- Cowley, M. -- Tate, A. -- Adams, L.
THE SPOKEN WORD TREASURY: 100 MODERN AMERICAN POETS READING THEIR POEMS, VOLUME II from Yvor Winters to Robert Lowell. . THE SPOKEN WORD TREASURY: 100 MODERN AMERICAN POETS READING THEIR POEMS, VOLUME III from Gwendolyn Brooks to Robert Kelly (1940s to 1960s). Reread After, poems by Jane Hirshfield. Stilt Walking at Midnight poems by Jonell Esme Jel'enedra. Class 30 of Ancient Greek Course; part III. Class 29 of Ancient Greek Course; part III. Finished one of the text's for Poetry of the Heart Course: Heart: A Natural History of the Heart-Filled Life by Gail Godwin. Class 28 of Ancient Greek Course; part III. Class 27 of Ancient Greek Course; part III. Dipped into God's Problem: How the Bible Fails to Answer our Most Important Question — Why We Suffer by Bart D. Ehrman. The least gripping of the books (read so far) by Ehrman, possibly because it centers on the single philosophical point of suffering in the world and how this lead theologist Ehrman to agnosticism. The Lost Gospel of Judas Iscariot: a New Look at Betrayer and Betrayed by Bart D. Ehrman. Possibly the best of Ehrman's books in terms of helping the lay reader understand how the New Testament, including the images of Judas, was shaped to match doctrine. Class 26 of Ancient Greek Course; part III. Class 25 of Ancient Greek Course; part III. (5.26.2009) Day 17 of Poetry of the Heart Course. Memorial Day holiday so no Class in Ancient Greek Course; part III. Class 24 of Ancient Greek Course; part III. A Most Wanted Man by John LeCarré. Fascinating novel, particularly for its portrayal of the delicate turning and handling of people that thought they were free into collaborators, as well as for LeCarré's contrast with the crasser measures under the CIA of George W. Bush's presidency. Class 23 of Ancient Greek Course; part III. Class 22 of Ancient Greek Course; part III. The Shadow of Sirius (2008), poems by W.S. Merwin. Abandoned Hand to Mouth : a Chronicle of Early Failure by Paul Auster. A novella-length memoir of his years as a penniless writer. Three appendices of plays (indebted to Sam Beckett), a baseball card game, etc. Not attention-grabbing, sadly. The Locked Room (1986); volume 3 of the New York Trilogy. Finished dipping into Modern Japanese Writers and the Nature of Literature (1976) by Makoto Ueda. A precursor to his Literary and Art Theories in Japan (1998) by this skilled author on Bashō and the Art of Haiku. [pp. 5-6] The artist, according to Sōseki, is a person especially gifted in creating, through his mind, a structured semblance of external reality that gives meaning to an otherwise meaningless life. ... He first established that people have three main faculties — intellect, emotion, and will — and that they can be classified according to the ways in which they apply these faculties to external reality. He then went on to say: "Now, those who apply intellect [in the main] are people who elucidate the interrelationships of things; they are labeled philosophers and scientists. Those who apply emotion are people who taste the interrelationships of things; they are known as artists and men [and women] of letters. Those who apply will are people who improve the interrelationships of things; they are called warriors, statesmen, beancake makers, carpenters, and so forth." What he seems to have meant by it [the word taste] was a subjective feeling of like or dislike. ... An artist ... leaves them [things] where they are and tries to understand them through his sensibility. This enables him to represent them in a way that involves emotion. [p.9] The limitation of Sensei's [main character in his best known later novel Kokoro] viewpoint reflects that of Sōseki, who confined emotion to the sphere of the consciousness. 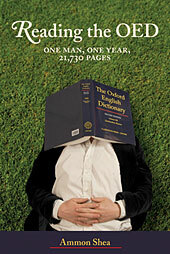 Reading the OED: One Man, One Year, 21,730 Pages by Ammon Shea. Another of the best books read in 2009. Everyone knows that the OED stands for the "Oxford English Dictionary", of size as in Shea's subtitle. It is also 20 thick volumes, with 59 million words. From A to X: A Story in Letters by John Berger, a long-list nominee for the 2008 Booker Prize. 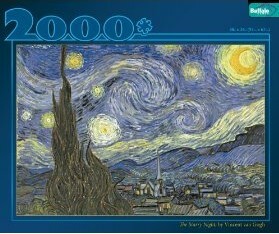 One of the best books read in 2009. Poetic writing by A, telling (explicitly and implicitly) her political-prisoner beloved how goes the revolution. Much is present in the silences and spaces. This is a book of controlled rage sculpted with tools of tenderness and a searing political vision. Everything he writes about is profound, precise and invoiced: Liberty and the lack of it, hope and the lack of it, power and the lack of it, love and the terrible yearning that takes its place when the loved one has been taken away. Class 19 of Ancient Greek Course; part III. Abandoned listening to the WORST BOOK I have attempted this year: Scott Smith's unrelentingly horrible horror novel The Ruins (2006). The characters are dull and silly people that deserve to meet what www.Bookslut calls "an EVIL Machiavellian mind-reading, tourist-impersonating, cell-phone-mimicking, blood-sucking, acid-sap-bleeding vine ... and there is nothing worse than a plant gone bad". Though as I was haunted by John Wyndham's TRIFFIDS (as in The Day of the Triffids) in my childhood, this villain of a localized vine just seems a little on the meek side. I mean, come on, develop wind-borne seeds. Finished James Tate's Worshipful Company of Fletchers, another of his collections of surreal and sometimes funny poems. Class 18 of Ancient Greek Course; part III. (5.7.2009) Day 12 of Poetry of the Heart Course. Class 17 of Ancient Greek Course; part III. Class 16 of Ancient Greek Course; part III. Finished reading Shadow Prey (1990) by John Sandford (Pulitzer prize-winner John Camp). This early book (second in the series) is primarily interesting for background on the series. Shows Detective Lucas Davenport overplaying his hand and being saved by a smart NYPD cop. Lacks the humor of some of the later books in the series and the insight into the mind of the psychopath is more what we see of Davenport than of the killers he is trying to catch. Crude in places. Finished listening to Winter Prey (1993) by John Sandford (Pulitzer prize-winner John Camp), read by Richard Feronne. 5th in the series. Detective Lucas Davenport hides out in the frozen north and meets a possible love-of-his-life. Shows a little of the warped and unredeemable mind of the PIQ (psychopath-in-question). Class 15 of Ancient Greek Course; part III. Class 14 of Ancient Greek Course; part III. Class 13 of Ancient Greek Course; part III. 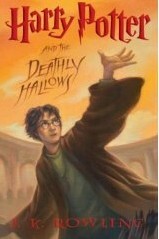 with annotations by Albus Dumbledore. Finished The Founding Fish by John McPhee. This was a fascinating introduction to the skills and challenges and history of shad fishing, about a fish that nourished most of the early Europeans in north america. I am especially heartened by his setting the story straight about the pain and stress caused to fish and often irrecoverable damage to the fish caused by the nasty 'catch and release' program. Class 12 of Ancient Greek Course; part III. Class 10 of Ancient Greek Course; part III. Abandoned skimming Angelica by Arthur Phillips. A scary little story where there are as many versions of the story as there are tellers and readers. Abandoned dipping into The Best American Short Plays 2004-2005 edited and introduced by Barbara Parisi. Some are ok but most do not come off the page convincingly. Class 9 of Ancient Greek Course; part III. Winters, Y. -- Williams, O. -- Hughes, L. -- Spencer, T. -- Nash, O. -- Cullen, C.
Moore, M. -- Holmes, J. -- Eberhart, R. -- Warren, R. P. -- Kunitz, S. -- Rexroth, K.
Auden, W. H. -- Roethke, T. -- Engle, P. -- Scott, W. T. -- Bishop, E. -- Cunningham, J.V. Patchen, K. -- Everson, W. -- Sobiloff, H. -- Shapiro, K. -- Nims, J. F. -- Schwartz, D. (sadly, a pretentious reading with a child-like intonation rising occasionally to a pretense of anger). Rukeyser, M. -- Howes, B. -- Jarrell, R. (self-assured, down-putting, and snippy) -- Berryman, J. (one-time poetry pop star) -- Dodson, O. -- Garrigue, J. (one of the best in this set: meditation on love and nature, often using classical and metaphysical tropes). Stone, R. -- Summers, H. -- Ciardi, J. -- Viereck, P. -- Brinnin, J. M. -- Lowell, R.
Finished listening to Phantom Prey (2008) by John Sandford (Pulitzer prize-winner John Camp), read by Richard Feronne. This recent book takes a clichéd look at the violent schizophrenic. Detective Lucas Davenport gets shot and shot at. Unredemptive. Class 6 of Ancient Greek Course; part III. Finished The Bromeliad trilogy (1998) by Terry Pratchett. Delightful. Just like the Iliad before it, The Bromeliad trilogy is a tale of bravery and battle, the great and the small, and many possible gods. Nomes turn out to be as brave as but a more clever and intelligent species than Wee Free Men. Class 4 of Ancient Greek Course; part III. by Hardy Hansen and Gerald Quinn. Finished dipping into The Spartans by L. F. Fitzhardinge, in part as background related to Ancient Greek Course; part III. By starting with the actual evidence in ceramics, bronze and lead artifacts, sculpture, and so on, Fitzhardinge presents a compelling argument that the traditional image of the relative austerity and militarism of the Spartans is mainly a result of propaganda that originated with the Spartans. From Fitzhardinge, it appears that the Spartans shared many of the attributes of the people of Athens and other power centers in the mid-millennium B.C.E. Class 3 of Ancient Greek Course; part III. The Brooklyn Follies by Paul Auster. Listened to Auster reading in a hypnotic monotone. Amusing multiple short stories and quotations collaged into a novel. Class 2 of Ancient Greek Course; part III.